Do you ever wonder which idiom you could use to compliment or criticise someone’s actions? 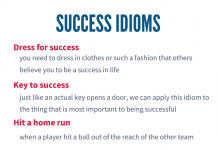 Here is an action-packed collection of idiomatic expressions related to sports and just being active in general. Go ahead, pull out all the stops and start using them today! Jump Idioms Infographic by Kaplan International Colleges. Used when someone does everything they can possibly do to achieve the result they want. I’m determined to pull out all the stops this time. I want my wedding day to be absolutely perfect. To know what is happening. To be fully aware and in control of a situation. Fred is the best person to take control of this project. He is always on the ball, and works really well under pressure. To remain alert and keep one’s attention focused on the task or matter at hand. Stop thinking about what he wants, this is an important stage in your career and you need to keep your eye on the ball! Make a mistake, disappoint everyone. I thought she’d be able to cope, but when the time came to present the results, she just dropped the ball….really badly. To jump up because one is happy. I’m so excited about my promotion, I could jump for joy! Used to indicate that the involvement of all the members of a team is required. We had all hands on deck to get everything prepared for Jenny’s surprise party. Used to express when it is someone else’s decision to do something. You know how he feels about it; the ball is in your court now. You have to decide what you want to do. Make all the important decisions. John will be calling the shots while our boss is on holiday. The person expected to win or succeed. Barbara is definitely the front runner for the Assistant Manager position. To start or allow someone else to start before everyone else. I’ll give you a head start because I know I can do my chores really quickly, and I’ll probably still finish before you anyway! He only finished first because he had a head start, otherwise I would’ve definitely won! Get comfortable after doing something for a while. It took me at least a month to get into the full swing of how things work in this company, now it’s all really easy and straightforward for me. At the peak of an activity, moving fast and efficiently. We got to Sarah’s house a bit late and the party was already in full swing. I thought I might have to stay in and babysit this weekend but luckily, Angela’s plans changed, so I got off the hook! Something that is visually pleasing or someone who is intellectually sharp, and stands out above the rest. That was such an eye-catching newspaper advertisement. It really did jump off the page! The second interviewee was incredibly talented. She really jumps off the page for me. Have a sudden burst of energy after being tired. I was exhausted after the 10th mile of running, but I got a second wind after I saw the sign for the final lap. To try your absolute hardest to succeed. Don’t think about whether you will win or lose, just give it your best shot. A straightforward or simple task that has no problems, and is very easy to complete. I don’t ever want to change my job. It’s just plain sailing and I get paid a lot for it! Someone who is much better than the rest. Most of the applicants were quite strong; they all seemed to have some good qualities, but Charlie Brown was in a league of his own. To take immediate and drastic action. I’ve decided to jump off the deep end and quit my job. I want to completely change my life and travel the world. To go to extreme lengths to get something done, or to please someone. Hazel jumped through hoops for her ex-boyfriend, but he didn’t appreciate her efforts enough. I nearly jumped out of my skin when I saw a man standing by the window! To seize the opportunity to do something. I jumped at the chance to do an internship placement with Google. I would jump at any opportunity to work within that law firm, even if it was a low-paid position, but it’s really hard to get any work with them! To make an assumption without considering all the facts. No, that’s not the reason why I was there. You’re just jumping to conclusions because you saw me with Helen! Rob has really hit it out of the park with his new entrepreneurial idea! To be leaders in a particular field/business environment. You have to stay ahead of the game if you want to be successful in the media business. A close contest between two groups/companies. It was a two horse race between the enterprises for quite some time. It was neck and neck between the two enterprises for quite some time. Getting quite close to the end. We’ve almost done it, we’re approaching the finish line now. You can’t give up at this stage! We’ve almost done it, this is the home stretch now. You can’t give up at this stage! To sell really well, a popular product. Those homemade pies are jumping off the shelves; we’ll have to make some more! To join a cause, follow or copy a popular trend or activity. I’ve noticed that most people in this office seem to have jumped on the bandwagon and started wearing those skinny jeans! To make it really hard for someone else to succeed over one’s self. You really gave that Property Developer a run for his money! Well done. Equal for everyone. Applying to everybody or everything. Bonuses were given across the board for such a successful year. At the present moment or time during an activity. It’s hard to predict what the outcome will be at this stage in the game. Do or say something that is very unfair or cruel. Martha had hit below the belt when she brought up his personal issues. That was below the belt Andy….there was no need to get my family involved. Do or say too much, more than is necessary. My mum always goes overboard when it comes to preparing for Christmas time! To criticise or become angry with someone. My boss jumped down my throat as soon as I mentioned booking another holiday! Used to describe someone who thinks they are the best. This could also be used in a positive way to compliment someone who is very skilful. That new hot shot in the Marketing team just talks about himself all the time! When someone is afraid of everything around them. Sally jumps at her own shadow; I don’t think she’ll want to watch that new horror movie! John had definitely met his match when a new player joined the tennis club. Start something with a good, smooth beginning and progressing well. She was off to a flying start when her course began, I don’t understand why she was nervous at all before! Trying not to fall behind in work, other duties or financially. These last few weeks have been tough at home; I’ve only just about managed to keep my head above water! Hopefully things will begin to get better now that I have money to pay the bills. Trying to understand new things. I’ll help you with everything for the first few weeks, while you’re learning the ropes. Something that may be difficult to accomplish, but is attempted anyway. That’s a bit of a long shot, I don’t think the boss will agree, but ask him anyway. You can only try! Another way of saying ‘Not a problem’. Be chosen to be part of a group or team. Unfortunately, Jane didn’t make the cut….but you did! Congratulations! Not as good as another. I really want to date Sarah even though I know she’s out of my league, and probably doesn’t even know I exist! A term used to describe a moment when something that was once great has reached a point where it will now decline in quality and popularity. I think that TV Series has jumped the shark now. They’re running out of ideas and it’s not even funny anymore! When there is almost no time left to accomplish something. I had to race against time to finish decorating the house. Jean decided to come home early and I wanted it all completed before she got back! Accept a challenge and do your best to succeed, or deal with a problem directly. Bill has a very strong character. He always takes the bull by the horns and never accepts defeat. To do something that is very risky. To put one’s self in a situation that could become quite problematic or dangerous. Jeremy is skating on thin ice, he had his licence taken away from him last week, but he is still driving his car! No, I can’t ask for more holiday, I’m already walking on thin ice after all the days off I had last month! I know I have some time before the end of my contract, but I want to get the ball rolling so I don’t have to rush to find a job in the last few weeks. To maintain the momentum of an activity. We had previously planned to end the book club early, but as there was a sudden rise in interest from the local community, we decided to keep the ball rolling throughout the summer. I don’t think you need to worry about the new team, you have a better squad and will definitely beat them hands down! There was no competition between them at all. You should have seen her play, she won hands down! To give up on something. I’ve decided to just throw in the towel and start looking for work elsewhere. It’s too competitive to get a decent job here. To be successful in everything that you do. Gareth seems to be batting a thousand with his online business this year. To leave or abandon something that is not doing well. The football manager did not jump ship, instead he decided to stay and support his struggling team. To test someone’s reaction to an idea, in order to get their opinion about it. Do you mind if I just bounce a couple of ideas off you about next quarter’s marketing strategy? We’ve cleared a big hurdle by getting all the legal paperwork completed for our new business. To do something impulsively, without thinking about the consequences. I just decided to dive in headfirst, and it was one of the best decisions ever! A good possibility of succeeding if you try hard. You have a fighting chance of getting that job, I know you can do it! To begin to do something without hesitating, getting started immediately. Some of the students decided to dive right into their studies when they started university. To begin something, to start something. We kicked off the summer by being the first ones to have a barbecue party in our neighbourhood. I decided to kick him off the pitch, because he wasn’t helping his team and kept starting fights with the other players! To establish the pace or speed of something. To fail or succeed by one’s own efforts. This industry is very competitive, you either sink or swim – you cannot be average. To be impatient and not wait for the right time. To do something too soon, especially without thinking about it carefully. Don’t jump the gun Chris, let’s just wait for them to tell us when it’s our turn. Don’t you think they’re jumping the gun a bit? They’ve only just met and they’re thinking about getting married already! A new set of circumstances, a completely new situation. I’m usually quite good with computers, but this software you’ve installed is a whole new ball game! Mr. Grove is very strict. When he starts teaching this class next year, it will be a completely different ball game. Something or someone that adds an unexpected twist to an activity or situation. They added our team as a wild card at the very last minute, to make the game a bit more interesting. To attack a problem with a lot of effort, in order to resolve it. Don’t worry Janice, we can tackle this problem if we work together. Someone who works well with others to achieve a common goal. I see myself as an excellent team player; someone who can be relied upon. To surprise someone by doing something unexpected. They threw in a curveball halfway through my interview and said I had to take part in a role-play situation. I think they wanted to test how well I could work under pressure! To briefly meet or make contact with someone, usually to update them or be updated on a matter. I stopped off in LA to touch base with Sally before coming home.